Childhood friends Zach Chance and Jonathan Clay are the great US duo Jamestown Revival. They write songs about everyday life that are a combination of lush harmonies that merge Southern country, Americana and Western rock music. Their debut album 'Utah' was originally self-released in early 2014 was then re-released by Republic Records later the same year. iTunes named 'Utah' - Best of 2014: Singer-Songwriter Album of the Year. 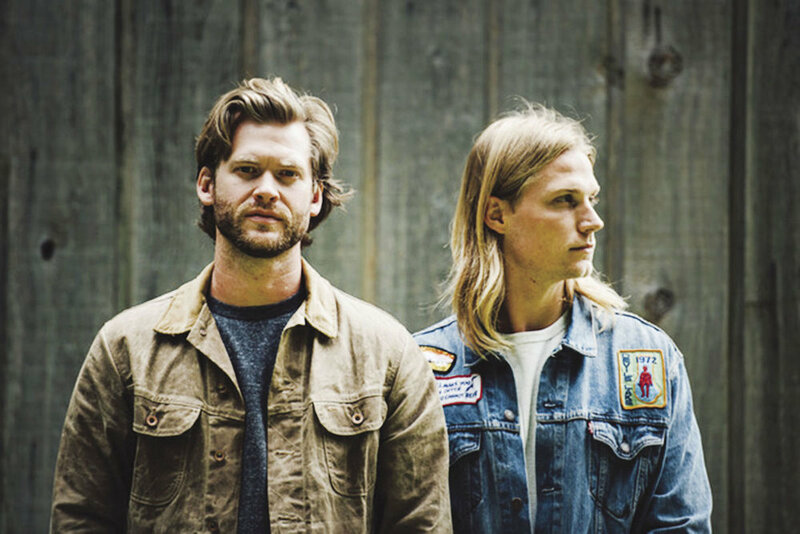 Zach Chance and Jonathan Clay grew up together in Magnolia, Texas and collaborated on their first song at the age of 15. Each launched solo singer-songwriter careers and were on tour as individual artists who would sing harmonies on each other's work. It was decided to form a band with harmonies at the forefront as it a generated positive audience response. Jamestown Revival was formed in 2010 as a duo and expanded to a five-member band.The name Jamestown Revival was derived from one of the first United States settlements, Jamestown, Virginia, homage to Creedence Clearwater Revival, and the concept of leaving behind the old and starting anew. The band wrote music they wanted to hear rather than what appealed to the masses using the music they listened to as a gauge of quality of their work. The band's music inspirations come from storytellers of adventure such as Louis L'Amour, Willie Nelson and John Prine as well as nature and simplicity. Jamestown Revival's first album, 'Utah', was named for the band's recording location in the Wasatch mountains, Utah where while living in a cabin they used minimal recording studio equipment to create a unique style.The band's move from Texas to California inspired their song California (Cast Iron Soul). Their new album 'The Education Of A Wandering Man' is another great step on their journey. “It’s about looking back on all the miles we’ve travelled over the past few years, and our fondness of the memories we’ve made,” explains Jonathan. “We knew our time on the West Coast was never permanent, and this song talks about the heart-warming thought of returning back to the hill country. We're learning a lot of the answers as we go, and this album is a snapshot of our observations and learnings over the past four years. Our education has been gained not in a classroom, but in our experience. It's a trial-by-fire, haphazard sort of process, but there's rarely a dull moment. This album details 'The Education of a Wandering Man,' and we named the album as such. It plays like a late night drive after one of our shows, shuffling through our highs, our lows, and everything in between. Much in the same way we recorded UTAH, we recorded The Education of a Wandering Man in a farmhouse outside of Austin. We did our best to convert the living room into a studio, and we locked ourselves away in the Hill Country. No 'producer,' no fancy setup, just 6 friends playing and recording music. We sincerely hope you enjoy" (Jonathan & Zach).